With the creation of Brick Township on February 15, 1850 came the need for a governing body. 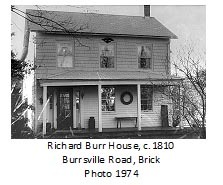 A five member committee type government was formed and held its first meeting on March 12, 1850 at the home of Richard Burr in Burrsville. The Township’s government changed with the growth of the community. The committee-type government of 1850 with five elected committeemen served the township until 1954. From 1954 to 1967 a committee-mayor government served the community. would serve for four years and seven elected-at-large councilmen, elected to two and four year terms. When the new government took over there were 90 full time township employees. 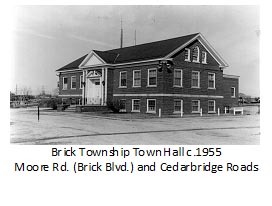 The Township government never had a home until a town hall was constructed in 1954 on the corners of Cedarbridge and Moore (Brick Blvd) Roads. During those one hundred and four years without a home the committee members met in the homes and businesses of various town officials, most frequently the home of the Township Clerk. Other committee meetings were held in the home of James Patterson, Adam Clayton’s Shoe Store, Lecompt & Loomis in Lakewood, The Times and Journal Office in Lakewood, Charles Hance’s store and B. L. Garrison’s Hotel in West Point Pleasant. In 1885 and 1886, meetings were held in Point Pleasant Beach Borough Hall to discuss the division of properties during its secession from Brick Township. There were also meetings in the West Point Pleasant School and at Sidney Herbert’s Store in Herbertsville. Between 1902 and 1917 most meetings were held at Mrs. Thomas Havens Building in West Point Pleasant, Mrs. Havens was Township Clerk during that period. Between 1918 and 1920 meetings were held at A.M. Allen’s store and the Schoolhouse in West Point Pleasant. During this period without a town hall, the various township departments worked out of the residence of its respective appointed department head. On April 21, 1920, West Point Pleasant seceded from Brick Township, becoming Point Pleasant Borough, and the Brick Township government had to relocate its meeting place. On August 2, 1920 the Township government began meeting at Laurelton Hall and remained there until 1926. On May 4, 1926, the Township Committee held its first meeting in Ivy Hall on the campus of the Orient Baptist Church of Laurelton (First Baptist Church of Laurelton). It was during those years of meeting at Ivy Hall that the Township Committee had to address the loss of the cranberry industry and replace it with a new industry that would raise revenue for the Township and provide jobs for residents. The Township began to attract developers who came to build resort communities. The communities provided beaches, a club house and docks for boats with the purchase of a lot and cabin. Some of the resort communities built during that era were: Riviera Beach, Breton Woods, Cedarwood Park, Beverly Beach, Deauville Beach, Godfrey Manor, Laurelton Park, Mantoloking Dunes, Metedeconk Pines, along with others. They also had to deal with the depression years of the 1930‘s, World War II, the Korean War and the inflationary periods that followed. While meeting at Ivy Hall the Township Committee also made plans for constructing a municipal building and establishing a new form of government for the Township. Some residents, not seeing a need for a town hall, called it, “Joe Crate’s Folly” since Committeeman Joe Crate originally proposed the idea. For 104 years the Township government did not have a home until 1954, a town hall was erected on the corners of Moore Road (Brick Boulevard) and Cedar Bridge Road (where Towne Hall Shoppes are today) Town Hall opened January 1, 1955 and housed the Township government, the Municipal Court and the New Jersey State Police. No longer would township documents have to be kept in the homes of town employees. The last Township meeting at Ivy Hall took place on December 29, 1954. On January 1, 1955 the Township government not only had a new municipal building, but also a new form of government, a Committee-Mayor type government. The three committeemen present at that Meeting on January 1, 1955 selected Ernest Hulse as mayor for a one year term. By the 1970’s the Township government had outgrown its 1955 building so plans were made for a new town hall to be constructed on Chambers Bridge Road. 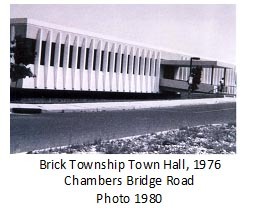 The new Town Hall which was dedicated on May 31, 1976, just weeks before the Nation’s Bicentennial, housed the Township Government, the Justice Department and the Brick Branch of the Ocean County Library.